The 2010 Chinese Gold and Silver Pandas have been issued by the People's Bank of China. This year's program consists of ten different issues, including seven gold and three silver coins with a new reverse design. The high quality bullion coins have become popular around the world. The Gold and Silver Pandas feature a common obverse design depicting the Hall of Prayer for Good Harvests of the Temple of Heaven located in Beijing, China. An inscription in Chinese indicates "People's Republic of China" along with the year "2010". The new reverse design for 2010-dated coins features two pandas at play. The face value of the coin, bullion weight, and purity also appear. 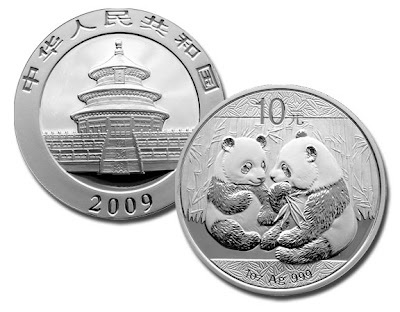 Each year, the coins have featured a different Panda themed design. All coins have a purity of 99.9% fine gold or 99.9% fine silver. The 2010 Gold and Silver Pandas were first issued by the People's Bank of China on November 30, 2009. The coins are minted by the Shenzhen Guobao Mint, Shenyang Mint and Shanghai Mint, and solely distributed by China Gold Coin Incorporation. wao its look like a google panda..